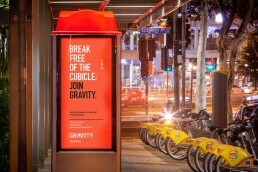 Following the success of the brand launch and its rollout to Gravity’s spaces in Sydney, Melbourne and Brisbane, we looked into how we could assist the team and help meet the challenge of building membership numbers in its new Brisbane location. 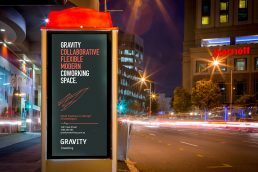 Given that the concept of coworking has not yet been taken up to the same levels as Sydney, it was important to keep things simple, impactful and strongly branded. 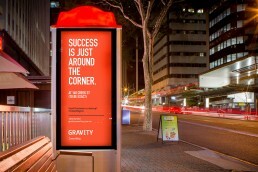 We opted for street advertising, given its potential audience exposure and planned this in a very targeted area, within a few blocks of the Gravity Brisbane space. 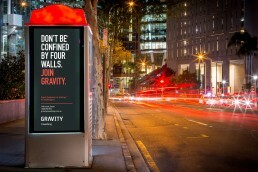 We then set to work crafting simple but contextually appropriate messages to help push the idea, with a subtle play on the limited physical space of the advertising medium itself. The outcome proved hugely successful, increasing walk-ins and enquiries by factors of 10 and the concept was duly repeated further down the marketing campaign track.